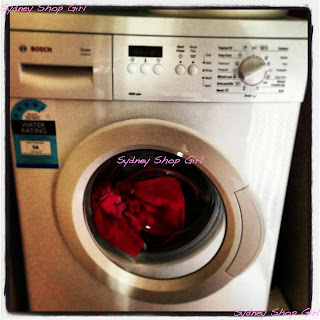 Sydney Shop Girl: Crossing the Friday Finish Line. Eurovision. Well, that was a week that needed a really deep sigh to farewell it with. Nothing says drama llama more than a black and white selfie before hitting the Friday afternoon peak hour. It looks like I'm officially on leave now. I am being melodramatic. Friday wasn't so mad after all. My absence greeting got recorded on the first take and my out of office reply even featured the right date and year for a change. The desk has had a brisk wipe down (desk lunches and overflowing mugs of tea) and it's looking so uncluttered, it's as if it belongs to someone else who actions paperwork the moment it lands in their inbox. There was some drama in the evening though when it came to the juniors searching for the handover I promised to print out for them and place on a prominent wall in the office. Apparently a frantic half hour search failed to identify which to which wall the notes were attached but the correct wall was finally located after I navigated over the phone. I know. There are only usually four walls to a room. The juniors were humble enough to feel a bit sheepish that they'd only done a 'boy look' before calling me. Does a lot of 'boy looking' go on in your office? My usual Saturday morning get up and go got up and went today. After the build up of the last few weeks and finally crossing that Friday finish line, I fell into a heap of relief this morning. My colleague and travel mate sent me a congratulatory text message and we agreed to charge our glasses for survival and resilience on take off tomorrow. In between messages, I had a very slow coffee and croissant as I got into the holiday zone with the travel pages. Then it was a stroll home to take advantage of the sun with a bit of laundry. I have a front loader confession. In all the years that I've owned mine, I've never checked or cleaned the door seal. Which is why it looked decidedly mouldy when I tried to use it today. Apparently it's a common issue that you're meant to prevent by keeping the door open as much as possible and doing washing cycles with bleach or vinegar. I spent the morning following the tips in this article. The things you learn reading this blog. I picked up the pace around lunchtime with personal training. In hindsight, it wasn't the smartest move confessing to my trainer that a lot of eating would be happening whilst I was away. Today's session was filled with a move more excruciating than squats and burpees combined. Have you ever done a Turkish Get-Up? Even if you have, take a look at this video. Even the 'don't talk to me about pain, I've survived childbirth!!' brigade will be forced to recalibrate their pain scales. Just saying. The up side (and there's always an up side in my world these days, I'm committed to looking until I find it) is that I think my metabolism has been reset to efficiently burn every Starbuck's Grande Caramel Macchiato and calorific chicken salad with fried wonton wrappers I eat in the US next week. Plus the cheesecake wedges. I've planned everything there is to plan for this trip - the shopping and the eating. Are you excited about Eurovision 2014? I am. 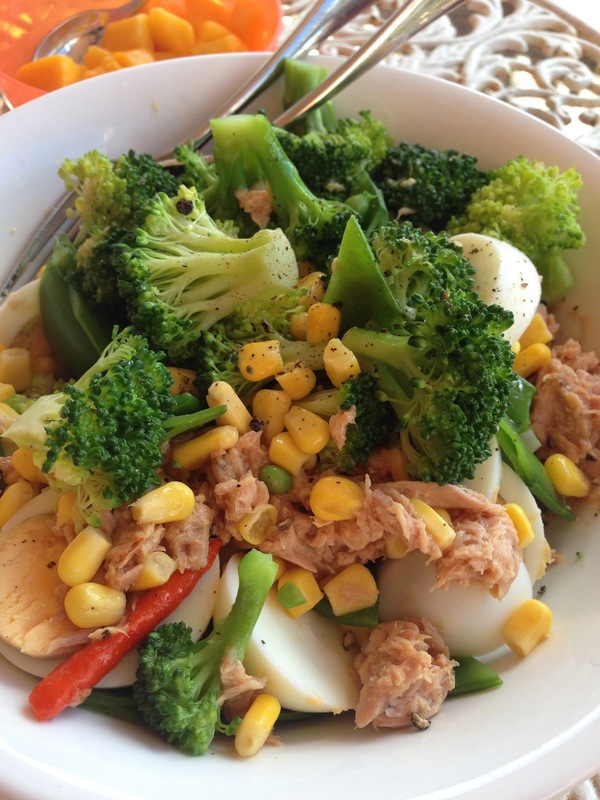 I even had a very patriotic green and gold themed salad for lunch in honour of Jessica Mauboy. Jessica is a national treasure. I'm planning to watch the SBS documentary about how she came to represent Australia this year and then kick back and enjoy the second semi final afterward. Turkish Get ups? I refer to them as TURKISH TORTURES! !